Jessica Lobdell Photography: Summer Camp! It is getting to be that time of year again! It is time to get your kids out of the house and out doing something fun. 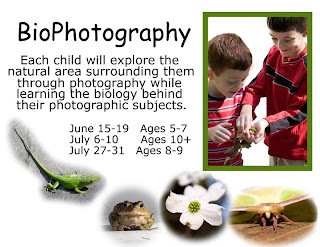 I'll be teaching "BioPhotography" at Our Neighborhood School's summer camp in which I'll lead children in their observation of nature while teaching them the fundamentals of photography. This camp is available for 5-10 year olds. As you may know already, I have an enthusiasm for the natural world and for photography. I hope to share that excitement during these three weeks. Please call me at 336-972-0097, or Donna from Our Neighborhood School at 919-545-0900 to learn more about this summer camp!